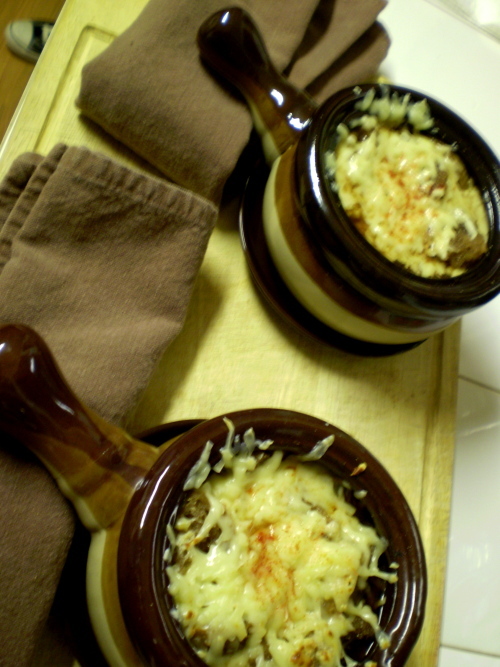 There is absolutely no reason to ever eat French Onion Soup out of a can. I can’t even imagine it. This takes some time because of the caramelized onion but it is very well worth it. Slice up onions and saute them in butter and olive oil. Cook over medium heat stirring every now & then for about 1 hour until they’re a pan of golden brown caramelized goodness. While the onions are cooking put on a pot of beef stock. Drop in garlic cloves, mustard powder and red wine and simmer while onions are cooking. Grate the cheese and lightly toast the slices of baguette under the broiler. Once the onions are ready add them to the beef stock and bring to a boil. Turn down the heat and let it simmer for 15 min. Fill soup bowls, put in toasted bread and top with cheese. broil on high until cheese is brown and bubbly. Serve with bread and slices of hot Genoa or some other yummy rich sausage. Oh yeah. That’s the goods.